DutchAmsterdam.nl — Amsterdam’s efforts to somewhat curtail the ever growing flow of visitors during the annual Queen’s Day1 celebrations have paid off, the city says. But the event was no less exiting than it was in previous years. At the time there was some criticism, but a study by the city’s research and statistics service determined that 68 percent of Amsterdam locals agreed with the mayor’s decision to spread smaller-scale events over the rest of the city. Many Amsterdammers said they have been shunning downtown Amsterdam during Queen’s Day because of the massive crowds. 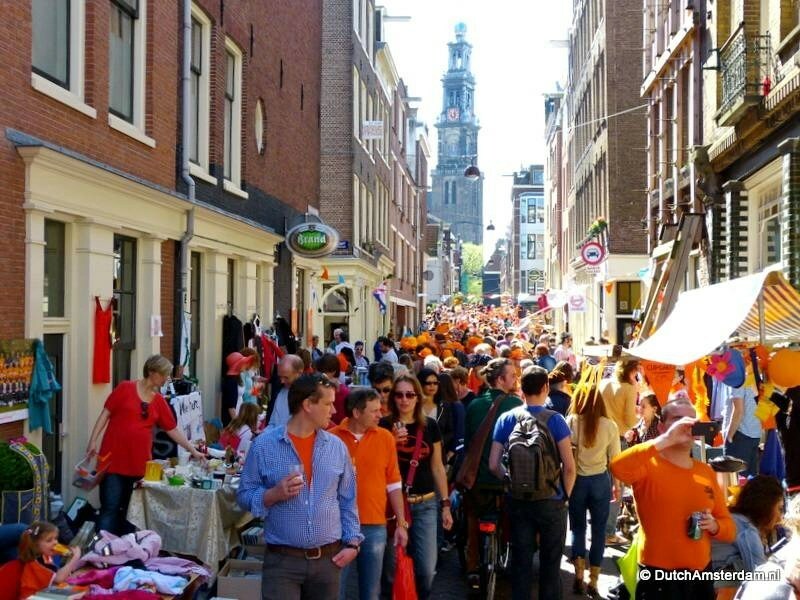 The City of Amsterdam says it is pleased with the way this year’s Queen’s Day transpired. It was an attractive, manageable event. Police say the atmosphere in the city was friendly. Among the celebrants were noticeably more Amsterdam locals, and among visitors from elsewhere there were more families. There were significantly fewer incidents. By 6:00 pm police reported at total of 175 incidents — down from 697 last year. Most incidents last year were alcohol-related. This year, the rules regarding the sale of alcohol were stricter than in previous years, and the supermarkets of Albert Heijn even closed their stores in the city’s center. As in other years, the Jordaan district was a hugely popular destination. On Queen’s Day, April 30th, there are celebrations throughout the Netherlands. However, the most popular destination is Amsterdam. In 2011 over 800.000 people visited Amsterdam for Queen’s Day, up from 610.000 in 2004. May of them were drawn to the city by several free, large-scale concerts, such as those held at Museumplein by Radio 538 and at Rembrandtplein by SLAM!FM. On a typical day the city can easily absorb more than 800.000 visitors — in addition to Amsterdam’s 760.000 residents. But the Queen’s Day crowds present big logistics problems, such as finding a way to transport the huge crowds back home in an orderly fashion at the end of the day. The Netherlands Railway Service (NS) can process about 50.000 people an hour via Central Station. During most of the day there is no public transport in the city’s center. There is no car traffic either since people throng the streets shoulder the shoulder.